Cleveland Browns tight end MarQueis Gray (47) can't reach a wide open overthrown pass 2nd quarter at MetLife Stadium. After starting out with a 10-0 lead, the Browns were outscored 24-3 on their way to losing their sixth-straight game, 24-13. It was also their ninth loss in their last 10 games. With one game to play, the Browns are 4-11. 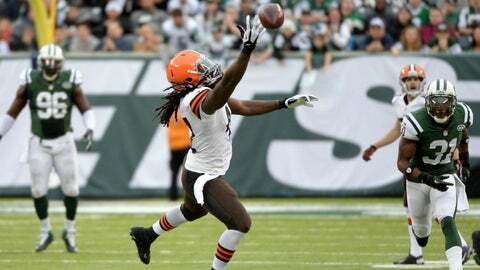 The Browns continued to allow scores late as the Jets scored two touchdowns in the fourth quarter. The Browns have now been outscored 142 to 69 in the fourth quarter. Rearing its ugly head once again was the Browns horrendous play on third down. The Jets converted 12-of-18 of their third down attempts. Former Browns wide receiver David Nelson caught both of Geno Smith’s touchdown passes, while Smith ran for another in leading the Jets to the win. Meanwhile, the Browns offense struggled once again. Four times the Browns were inside the Jets’ 10-yard line and scored just one touchdown. They stalled at the three-yard line and nine-yard line and settled for field goals. On another occasion, the Browns had a first down on the one-yard line and failed to score, turning the ball over on downs. Their only score in the red zone came on a five-yard run by Edwin Baker. Jason Campbell was 18-of-39 for 178 yards with two touchdowns. Bad Jason: QB Jason Campbell had another sub-par game and finished just 18-of-39 for 178 yards with two touchdowns. He was 8-of-22 for 71 yards in the first half. Flash Gordon: WR Josh Gordon had six receptions for 97 yards and had a rush for 22 yards. He had just two catches for 30 yards in the first half. He ran a reverse for 22 yards. Gordon dropped a pass in the end zone in the first half. Baker: RB Edwin Baker scored his second touchdown in as many NFL games in the first half. He had 64 yards on 17 rushes and a touchdown. He had 10 carries for 29 yards in the first half, including a five-yard touchdown. It was the first rushing touchdown on the road this season for the Browns. Baker also caught two passes for 12 yards. Baker scored another rushing touchdown in the second half, but it was called back on a false start by TE Gary Barnidge. Taylor Hurt: DL Phil Taylor was taken to the locker room with a head injury and was being evaluated for a concussion. DB Joe Haden re-injured his hip. 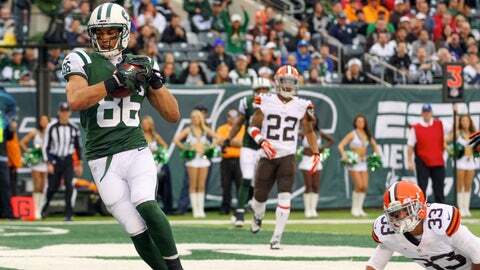 Nelson Haunts Browns: Former Browns WR David Nelson scored two touchdowns and caught a key third down pass. He scored the Jets first two touchdowns of the game. Nelson caught another touchdown to open the fourth quarter to give the Jets a 17-10 lead. He finished with four receptions for 33 yards and two touchdowns. Flew the Coop: With WR Davone Bess being placed on the Reserve/non-football illness list, WR Josh Cooper was active. He caught three passes for 24 yards in the first half and finished with four for 26 yards. Mingo Brigade: LB Barkevious Mingo wasn’t fooled on a double reverse and dropped the Jets’ Saalim Hakim for a 11-yard loss. Back to Back: The Jets were called for back-to-back personal fouls. Rookie DL Sheldon Richardson was called for unnecessary roughness for hitting QB Jason Campbell and then another personal foul was called for an outburst to give the Browns a first down on the one-yard line. The Browns still couldn’t score and turned the ball over on downs. K2: TE Kellen Winslow caught a 16 yard pass from QB Geno Smith and hurdled DB Buster Skrine. Earlier, Winslow was called for holding negating a 29-yard gain on a pass from Smith to RB Bilal Powell. Winslow finished with three catches for 35 yards. 100 Yard Day: After not allowing a 100-yard running back in the first 13 games, the Browns allowed back-to-back 100 yards games to the Bears’ Matt Forte and the Jets’ Chris Ivory had 109 yards on 20 carries.